If you’re like me, the whole idea of using fitness or health apps always seems great. A few weeks later it’s a different story. I stop using them either through boredom or the regime I’m on has gone downhill. For many like me, an incentive always helps when it comes to trimming a few pounds. Enter SlimKicker, a free new iOS app that offers users the opportunity to win prizes whilst getting slimmer. In a nutshell, “SlimKicker turns your diet and weight loss goals into a winnable, level-up game”. To be honest, when we first heard about SlimKicker it’s hard not to think it could be a little gimmicky. But after reading a little deeper, SlimKicker may have something a bit different. Stay motivated and excited. 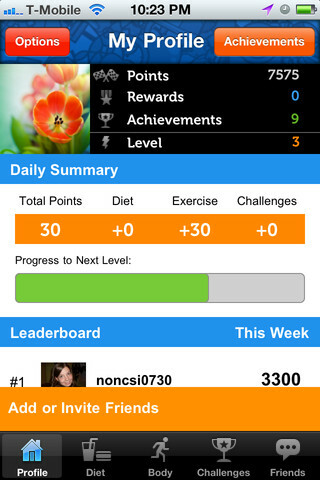 Rack up points for tracking healthy calories, logging your workouts, and completing challenges. Stay accountable. Enter seven to 30 day diet and fitness challenges with others, and “check-in” daily to tell us how you’re doing. Win prizes. As you level up, you get to participate in giveaway challenges where we give away special prizes. Personalised advice. Get personalised reminders from our virtual coach based on your activity. Number three got me very interested. This could be a real draw for many. Points, badges and rewards like that just don’t do it for me, but the opportunity to win tangible prizes as a result of creating new, healthy habits that improve our lifestyle is a fantastic idea. I like a few other features as well. The points system is referred to as “Weight Watchers in reverse,” as users gain more points for choosing healthy foods versus unhealthy ones. The “Challenges” issued by the app are also pretty neat. For example, if one user is attempting to quit drinking fizzy drinks, the challenge will start out easy and gradually become harder. The more difficult the challenge, the higher the points earned. Overall, I believe SlimKicker stands a decent chance of becoming a success in a market that is becoming more and more crowded everyday. The prizes will be key.